A successful business revolves around the knowledge, skills and dedication of its employees. In order for any business, large or small, to be successful, there needs to be plenty of teamwork involved. Most major corporations today depend on an assortment of various teams that oversee production and projects performed by different departments. These team workers must come together to create new ideas and organize plans in order for the business to grow and continue to be an industry leader. Why Use the Puzzle Pieces Template? Teamwork is an important part of any company. When employees come together to solve problems and make positive decisions, everyone benefits. In many ways, teamwork is like a puzzle. When putting together a jigsaw puzzle, all of the pieces must fit perfectly in order for the outcome to be correct. If the pieces do not align the right way, there will be problems. Puzzle pieces can not be forced together, they must fit easily, and if there are any pieces missing, the puzzle will never be complete. The Puzzle Pieces Template displays colorful pieces of a jigsaw puzzle being put together by four members of a team. The pieces could represent the ideas of a group of workers involved in a team program for a business. These team members must make all of their ideas come together in order to make their business plan work. The Puzzle Pieces Template is an excellent image to use in the background of a PowerPoint Presentation during business meetings; especially those meetings that are revolved around improving teamwork within the company. If you would like to use this image for your upcoming PowerPoint Presentation, follow the steps that are listed below. Make sure that you meet all of the necessary requirements. You must be using PowerPoint 2003 or later, and have enough space to download a 230 KB file. Click on the green Download button. Your download should begin immediately. Select the folder that you want to save the file in, and click Save again. Open the folder where you saved the file and double-click the downloaded compressed file. Extract the contents of the file and add the image to your PowerPoint Presentation. 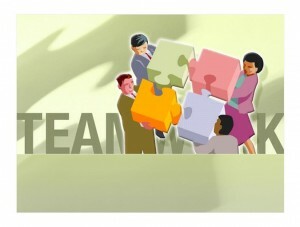 By using this image you will draw your audience’s attention to the main theme of teamwork. You may even want to express in your presentation how puzzle pieces are similar to working together as a team. Using colorful and insightful images throughout your presentation is a great way to successfully get your message across to your audience.